DEX co-founded in Leeds as charity of volunteers. 2001 – 2004 – Best Value Review (BVR) – Deaf-Led audit of education for deaf children, supported by the Local Government Association, Office of the Deputy Prime Minister and IDeA. The full time staffed audit took in the UK, Sweden and Norway, and involved eight local authorities in the UK and four Deaf schools with a sum total of 34 schools observed. Over sixty deaf children were interviewed, as were 30 parents of deaf children, professionals ranging from Ofsted to Heads of Services and schools and teachers and support staff. A literary review of research in deaf education was included. Presentations were given at European Day of Deaf Education (EDDE) and the World Federation of Deaf People in Montreal 2003. Report of findings published – Deaf Toolkit: Best Value Review of Deaf Education from Users Perspective, 2004. The Deaf community in Cornwall informed us that no deaf children were using BSL in Cornwall and, with the Deaf community, we petitioned the local authority to accept the need for deaf children to learn through the medium of BSL. Our findings from the Best Value Review were that deaf children need to have full access to education, which should include English and BSL bilingualism, a high standard of BSL provision from all staff. This led to our Framework for Action, and to campaign for a BSL Act which must include ensuring parents of deaf children fully understand their deaf child’s needs in education, and the correct resources are in place. 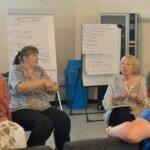 Published Between a Rock and a Hard Place: The Deaf Mainstream Experience, 2004 – personal accounts by deaf mainstreamers. 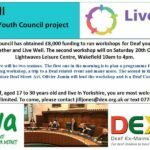 In 2006 Bradford Council commissioned DEX to map its services for deaf children as it was definitely closing the Thorn Park Deaf School and moving deaf pupils to resourced mainstream schools. We consulted with the council to ensure the best possible move to mainstream education, including two types of resource within one: deaf children educated mainly in the resource base, and others in mainstream classes for most of the time with support. Lobbying the government to raise awareness of the BVR and to support the growing call from the Deaf community about the lack of movement following the Recognition of BSL in 2003. Worked with Sir Malcolm Bruce, MP and the Chair of the All Party Parliamentary Group on Deafness (APPGD) to table a Private Members Bill for a BSL Act. As directed by Sir Malcolm, we drafted a BSL Bill based on the Welsh Language Act 1993, as we had had extensive consultation with the Welsh Language Board and Welsh bilingualism researchers, who gave permission to do this. The Private Members Bill was not successful. Lobbied Ed Balls, Secretary of State for Education, who raised £1.5 million to raise the standard of BSL in education. The Department for Children, Families and Schools (now the Department for Education) established a Steering Group comprised of DEX, DCAL at the University of Central London, and the University of Sussex. 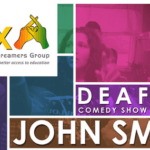 A tender was put out for a consortium of deaf organisations to bid for the funding, and the NDCS, Signature, Exeter Royal Academy for Deaf Education, UCLAN, Action on Hearing Loss became I-Sign. There was a survey to all local authorities about their level of BSL provision to deaf children, and a Family Sign Language website (now closed down). Deaf training the trainers in teaching Family Sign Language was also part of the commissioned work, which ended in 2010. The I-Sign project did not address how parents should be informed about BSL during diagnosis and Early Age. Consulted with Camden Council to state that Frank Barnes Deaf School should not be closed, and the school remained open. 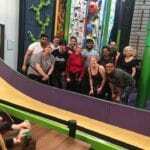 It has recently moved to a state of the art Deaf school in Kings Cross area. We also added our views to consultation by Bristol Council for Elmfield Deaf School which was under threat of closure, and has remained open. The Children and Families Act 2014 instigated new changes in Special Educational Needs (SEN). The DfE commissioned the National Sensory Impaired Partnership (NatSIP) to advise and support with changes for deaf, blind and deafblind children. There were six threads to this work, one of which was BSL, and NatSIP established a BSL Consortium. The members of this were DEX, Signature (as the Chair), NDCS, BDA, Frank Barnes Deaf School. 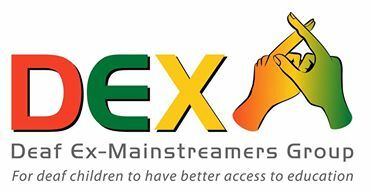 As a result of this membership NatSIP sub-commissioned DEX to set up a Focus Group of deaf young BSL users in 2014. 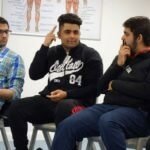 The Focus Group project took one year to outreach for suitable deaf young people, with the help of Support Services in West Yorkshire area. The group was asked two things: their personal experiences of mainstream school, and to comment on the changes in SEN arising from the Children and Families Act 2014. The findings were written up as a report for the DfE and displayed on NatSIP’s website, linked to the websites of the British Association of Teachers of Deaf (BATOD) and NDCS. We also did a joint presentation at BATOD’s conference to outline the findings of participation with the group of 15 deaf young people. 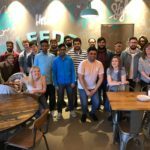 The Deaf Young People’s Focus Group wanted to continue so we fundraised for monthly activities, and the group changed its name to the DEX Deaf Youth Council (DDYC). 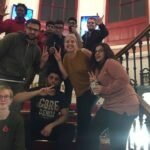 They currently have a My Deaf Story Heritage Project, due to end this summer, which includes their learning Deaf history, culture and creating and performing a play – all led by Deaf historians, comedian, scriptwriter and producer and director. The play is called My Deaf Story, performed in a theatre in 2016. The group is currently finishing off films for councils’ Local Offer websites in West Yorkshire. The Consortium on Research in Deaf Education (CRIDE) began surveying all local authorities on the numbers of deaf children, the communication methods and services. Tallying with our estimation in the BVR was that only approximately 10% of all deaf children in the UK use BSL. We then undertook our own research into language planning which is a distinct linguistic discipline to measure and save endangered or threatened languages. We gave our research paper’s findings : Towards language planning for sign languages: measuring endangerment and the treatment of British Sign Language at the LAUD Conference (a linguists’ organisation) in the University of Koblenz-Landau, Germany in 2014. This was the first time a language planning paper on a mainstream sign language has been given. The paper has subsequently been published in Endangered Languages and Languages in Danger: Issues of Documentation, policy and language rights, 2016. Ed: Filipović and Pütz. Publisher: John Benjamins Publishing Company. The conference and individual and eminent linguists at the conference or non-delegates all agreed with DEX’s findings that BSL is a severely endangered language according to UNESCO’s Language Vitality and Endangerment Methodological Guideline, again based on Language planning theory (Fishman et al). Further to the All Party Parliamentary Group on Deafness (APPGD), the previous Minister for Disabled, Mike Penning, had asked for them to conduct an Inquiry in to the costs of BSL, since the government is concerned about the impact this could have on the economy. DEX them contacted two Language Economists who have developed a new linguistic discipline on how to measure the costs of threatened languages and make the case for their survival (e.g. French Canadian, Irish Gaelic). From that we have written another research paper with the aim of guiding MPs and House of Lords Members in the most robust Inquiry possible. We met the Chair of the APPG and were invited on the APPGD. A rep from the DDYC made an impassioned case for the Inquiry to be brought forward on their action priorities and DEX was asked to set up a subgroup to support the APPGD with the BDA and the NDCS. Apart from two project periods – the BVR and the My Deaf Story Heritage project – there have been no staff employed so our achievements have come from voluntary work by the DEX Directors, past and present. Without this committed input DEX would not be what it is now, so we warmly thank everyone for everything you have done for the future of deaf children.